At the Century Cycles store in Peninsula, we get a lot of questions about where you can camp in the area. 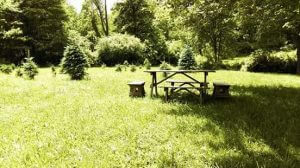 We have a list of camp sites near the Ohio & Erie Canal Towpath Trail on our web site. There is a new option located right in Peninsula, which will be especially useful for people bicycle touring on the Ohio to Erie Trail and the Underground Railroad Bicycle Route. 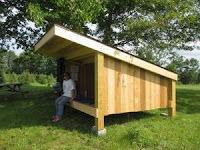 Heritage Farms now offers primitive camp sites. There are five tent sites that can accommodate up to four adults/two tents, or one family. There are also two three-sided shelters that can accommodate two adults or a small family. Each site or shelter is $25 per night. Each site or shelter has includes a trash can and picnic table. A water tank is available for wash water only; please bring your own drinking water. A central campfire site with starter firewood is provided. Fires are not permitted at the individual tent sites or shelters. Cooking with camp stoves is allowed at the tent sites and shelters. Drinking water and additional firewood is available for purchase. No outside firewood, no smoking, no alcoholic beverages, no firearms, and no pets are allowed. To make a reservation, call Heritage Farms at 330-657-2330. Check-in is from 12:00 - 5:00pm. Walk-ins are accepted for any vacant sites after 5:00pm. Heritage Farms is a 168-year-old 5th generation family-owned farm located at 6050 Riverview Road in Peninsula, Ohio (about 1/4 miles south of State Route 303).